A mega speedy one from me today as I'm at work and everyone is slowly phoning in sick! Eek! Anyway, as you've probably realised from my recent post, I went on a bit of a digi-shopping-spree the other day! One of those which I picked up was this super cute Tiddly Inks image.... So cute! Stamps: 'School Girl' by Tiddly Inks. Copic Markers: E00, E02, E11, E29, E31, E33, E35, E37, E50, R20, R22, R32, R35, R37, R59, YG03, YG63, YG67, B32, B39, B45, W1, W3, W5, W7 - available from Dies to Die For. Tools & Embellishments: EK Success Punch, ribbon and pearls from stash. a) I work in a University and so am generally surrounded by books and academia. b) At home, when I'm not crafting, I permanently have my head buried in a book (or my Kindle!). c) I love bright and bold colours! The only thing on my card that isn't like me is that I am actually blonde, not a brunette! I'm afraid I went for what would look better with my lovely papers, rather than how I actually look in real life! In addition, my legs are unfortunately 4 times the size of this pretty little thing....! Well, this is just delightful!!! I love every piece of it! I am glad I was one of the digis you picked up....lovely work! So cute and gorge papers too! I got a Kindle for X-mas - no one I talk to has even heard of it! I love it - how are you getting on? 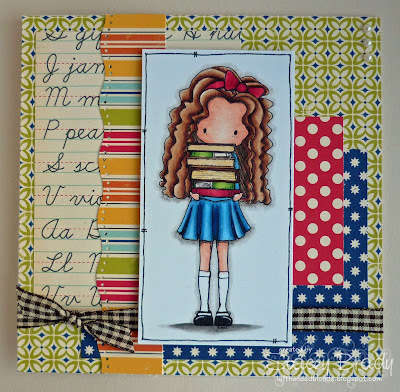 Oh she is a cutie, fabulous card you've made with her Stacey. Stacey!!! this is GORGEOUS!!! I loved learning about you and your card is a true reflection of all that you love! It's gorgeous!!! Delightful coloring and I love how crisp the image and colors are!! Wowzers - if you made this in a hurry I'd love to see what you make when you take your time!!! This is GORGEOUS!! I love your coloring style and the papers are just fabulous! Thanks so much for joining us at Tiddly Inks - I hope you'll join us again! Fabulous card Stacey! I was smiling whilst reading your desciption! I love the shading on the skirt furrows, perfect! Wonderful card! She is one of my favorite Tiddly Images! So glad you could join us at Tiddly Inks this week! Such a fabulous card! Your colouring is awesome and it was nice to get to know you this way. Thanks for joining us at the Tiddly Inks challenge this week. This is so sweet and gorgeous, Stacey! Lovely design and superb coloring, a fab card! Thanks for joining the Tiddly Inkers! lovely card I found it hard to do this challenge did you or did it just happen?